The schematic of the circuit schematic is mainly to use the schematic editor of Protel DXP to draw the schematic. The network report is a report showing the relationship between the circuit principle and the various components. It is a bridge and link between the schematic design of the circuit and the design of the circuit board (PCB design). Through the network report of the circuit schematic, the yuan can be quickly found. The connection between the devices provides convenience for later PCB design. The design of the printed circuit board is what we usually call PCB design. It is the final form of the circuit schematic. 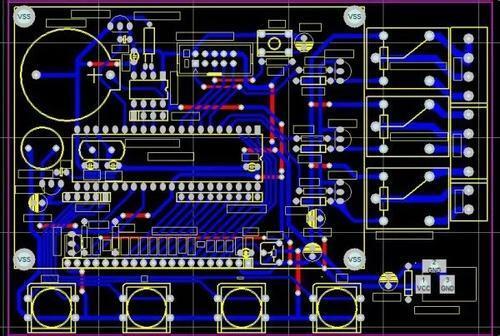 The design of this part is more difficult than the design of the circuit schematic. We can rely on the powerful design of Protel DXP. The function completes the design of this part. After the printed circuit board design is completed, various reports, such as generating pin reports, board information reports, network status reports, etc., are finally generated, and the printed circuit diagram is printed. (3) Remove the required components from the component library and place them on the work plane. 3. The drawing size, direction and color are mainly implemented in the “Documents Options” dialog box. Execute the Design→Options command to open the “Documents Options” dialog box. In the Standard styles area, you can set the paper size, click the button, and drop down the list. The paper size of A4~ OrCADE can be selected in the box. The setting of the drawing direction is set by the Orientation option in the Options section of the "Documents Options" dialog box. Click the button to select Landscape and set the horizontal drawing. Select Portrait to set the vertical drawing. The setting of the drawing color is realized in the Options section of the drawing setting dialog box. Click the Border Color color block to set the color of the drawing frame. Click the Sheet Color color block to set the background color of the drawing. 4. Execute the Design→Options→Change System Font command, and the “Font” dialog box will pop up. Through this dialog box, the user can set the system font, and can set the color, size and font of the system font. 5. Set the grid and cursor to be implemented in the "Preferences" dialog box. Execute the Tools→Preferences command to open the "Preferences" dialog box. Set the grid: In the "Preferences" dialog that opens, select the Graphical Editing tab. In the Visible Grids section of the Cursor Grid Options section, select the Line Grid option to set the line grid and select Dot Grid. The option is a dotted grid (no mesh). Set Cursor: Select Cursor Grid Options' Cursor Type option in the Graphical Editing tab. There are three cursor types under this option: Large Cursor90, Small Cursor90, and Small Cursor45. You can select any cursor type. PCB board technology, including computer-aided manufacturing processing technology, namely CAD/CAM, and light painting technology. The following introduces computer-aided manufacturing processing technology. Computer Aided Manufacturing (CAM) is a variety of processes that are performed according to a given process. All the process requirements mentioned above must be prepared before the light painting. For example, mirroring, solder mask expansion, process line, process frame, line width adjustment, center hole, outline line, etc. This process of CAM is completed. It is important to note that in places where the user file is too small, it must be handled accordingly. Because the process and technical level of each plant are different, to meet the final requirements of the user, necessary adjustments must be made in the production process to meet the needs of the user. All aspects of accuracy and other requirements. Therefore, CAM processing is an indispensable process in the manufacture of modern printed circuits. 1. Correction of the pad size, combined with the D code. 2. Correction of line width, combined with D code. 3. Minimum spacing inspection, between pads and pads, between pads and lines, between lines and lines. 4. Check the aperture size and combine it. 5. Check the minimum line width. 6. Determine the resistance welding expansion parameters. 8. Add various process lines, process boxes. 9. Perform line width correction for correcting side erosion. 10. Form a central hole. 11. Add a corner line. 12. Add a positioning hole. 15. Superimposed processing of graphics, tangent tangent processing. 16. Add a user logo. Since there are dozens of popular CAD softwares on the market, the management of CAD processes must first start from the organization, and a good organization will achieve twice the result with half the effort. Since the Gerber data format has become the standard in the light painting industry, Gerber data should be treated as the entire light painting process. If you use CAD data as an object, the following problems will arise. 1. There are too many types of CAD software. If various process requirements are to be completed in CAD software, each operator is required to be proficient in the operation of each CAD software. This will require a long training period to enable the operator to become a skilled worker to meet actual production requirements. This is not economical from a time and economic perspective. 2. Due to the large number of process requirements, some requirements are not achievable for some CAD software. Because the CAD software is designed for use, it does not take into account the special requirements of the process, so it cannot meet all the requirements. The CAM software is dedicated to process processing. Doing these jobs is the best. 3. CAM software is powerful, but all operate on Getber files, but can not operate on CAD files. 4. If CAD is used for process processing, each operator is required to have all the CAD software and different process requirements for each CAD software. This will create unnecessary confusion for management. In summary, the CAM organization should be the following structure (especially for large and medium-sized enterprises). (1) All process processing is unified with Gerber data. (2) Each operator must master the skills of converting CAD data into Gerber data. (3) Each operator must master the operation of one or several CAM software. (4) Develop a uniform process specification for Gerber data files. The CAM process can be relatively concentrated and processed by several operators for management. A reasonable organization will greatly improve management efficiency, production efficiency, and effectively reduce the error rate, so as to achieve the effect of improving product quality.